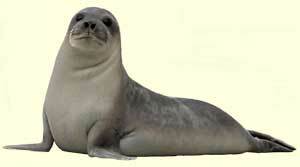 Seals are pinnipeds, semi aquatic marine mammals closely related to Sea Lions and Walruses. Careful observation of seals from humans has allowed us to learn a great deal about them. Seal Information, Anatomy, Reproduction, Feeding, Habitat and Conservation. Pinnipeds are found all over the world, and there are 33 known species of them. 19 are seal species. This is due to the fact that they have winged feet. Depending on the species of seal, there is quite a difference from the sizes. The largest ones can be about 16 feet long with the smallest of them being about four feet long. The terminology for seals includes males being called bulls, females being called cows, and the offspring being called pups. Many researchers believe that there are many species that have died off in the past. However, there is still a great deal of research that has to be done in that field. One of the most common types of seals is the gray seal. There are more of them than any other, and their numbers continue to increase annually. However, there are many other species of seals that are in jeopardy of extinction. There are many different reasons for such a decline in the number of seals found in the world. One that was quite significant occurred in 1988. A type of distemper virus quickly spread among them and that resulted in the death of 1/3 of all common seals residing within the North Sea. You will find that seals live from the coldest polar regions to the very warm climates around California. Seals are highly intelligent animals and they have been used in a variety of conservation programs such as those at Sea World. However, it is very important to understand they are still wild animals. They have been known to bite and to attack humans that get too close to them. This is due to their natural instinct to protect themselves, their young, and their surroundings. The largest of all seals is the Elephant Seal. Seals only spend about 20% of their time on land. They look like very gentle creatures though with their brownish bodies and their small heads. They are mammals due to the fact that they offer milk to their young pups until they are old enough to feed on their own. They are warm blooded too which is why they depend on their layers of fat to keep them warm when necessary. Some people take the stand that seals are lazy creatures. This is because they can often be seen enjoying the sun as they perch themselves on rocks. However, they are very busy when they are in the water which is most of the time. When they are on land for an increased period of time that means they are breeding, about to give bird, or molting. If you aren’t familiar with it, molting is the process of shedding their skin and this takes place for them once a year. It can take up to six or eight weeks for the molting period to be completed. They are often very noisy, irritable, and agitated during this period of time. Researchers once though this was due to it being painful for them but that isn’t the case. Instead it is now believed that it is because of the increased levels of hormones. The seals also don’t feed during this period of time but have enough blubber to survive on comfortably. There is plenty to learn about seals as a whole, but you can also find out a great deal concerning individual species. Take a look online, in books, and at animal conservation locations to find out all you can. You won’t be disappointed by the great information you come across regarding seals.